The end of the year is almost here. and by now you should have a pretty solid plan for how your business is going to operate and grow in 2018. 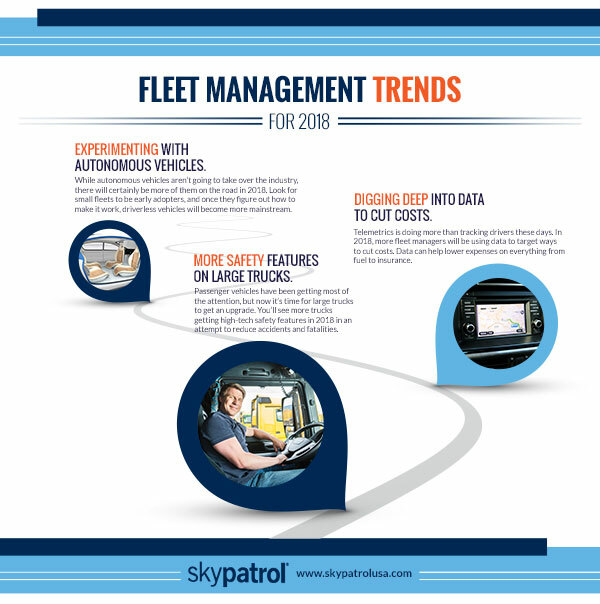 When you are making those plans, though, it’s important to know what changes and trends are coming to fleet management in the next year. This can help you make proactive strategies that incorporate new techniques and technologies that can help you grow smarter and faster and see bigger profits. Knowing what’s coming could help you stay ahead of the curve and keep an edge over your competition. So do you know what trends are coming in 2018? Here are some of the big ones that we see on the horizon. Check them out and let us know if they are the same things you see coming in 2018. Big trucks getting big safety features. When it comes to safety features on vehicles, you hear a lot more about what’s available on passenger vehicles than you do about what’s coming to large semi trucks. That’s already started to change and will continue to do so in 2018. Manufacturers are aware of the danger large trucks pose to other drivers on the road. According to data published by the National Highway Traffic Safety Administration, there were more than 4,000 people killed in accidents involving large trucks in 2015 within the United States. That’s more than 11 people every day of the year. The overall number of accidents reported is staggering, too, with “433,000 large trucks were involved in police-reported traffic crashes in 2015.” That’s more than 1,100 crashes each day. And unfortunately, the numbers seem to be getting worse over time, as in the last ten years “there has been a 10% increase in the total number of people injured in large-truck crashes.” It’s obvious that something needs to be done. Some manufacturers aren’t waiting for government mandates to make this technology standard. Tesla and Volvo are just two of them. However, it’s likely that passenger vehicles will have these features standard long before they become mainstream in large trucks and semis. You’ll be seeing a lot more of it in 2018 and for many years to come, though. Analysing data to cut costs. Lower fuel expenses. It’s likely the biggest expense in your fleet and something you are constantly trying to cut down on. Telemetrics to the rescue. With the right data, you can see which drivers are taking too much idle time, plan out the most efficient routes, and track driving habits to increase fuel efficiency. Lower maintenance costs. When drivers are using their vehicles safely and with good driving habits, those vehicles are going to need less maintenance as well as fewer repairs. Reckless driving practices can be spotted within the data and corrected before they become an issue. Fewer insurance claims. When fleet management software is in use, it encourages safer driving practices by monitoring driver behavior. That means fewer accidents and fewer claims on your company’s insurance. That can actually lower the cost of your policy, too, making your insurance costs less of a hit to your bottom line. Using fewer vehicles. When you can use data to develop the most efficient routes, you might find that you actually need fewer vehicles in your fleet. The more vehicles you can eliminate from your fleet through increase productivity and route efficiency, the fewer overall expenses you are going to have to maintain and purchase the necessary vehicles. If your company isn’t already tapping into the potential of data, you need to find fleet management software for your vehicles immediately. There are big opportunities that you could be missing out on. Love them or hate them, autonomous vehicles have arrived and it looks like they are here to stay. One Forbes contributor predicts that there will be 10 million self-driving cars on the road by 2020. Whether or not we hit those numbers remains to be seen, but one thing is for sure: you’ll be seeing more of them on the road in 2018. What remains to be seen, though, is whether consumers take to the idea of the autonomous vehicle before commercial fleets do. In general, most fleet managers are curious but wary of the autonomous vehicle. There are a number of upsides, including increased safety and reduced costs. But even the most advanced autonomous vehicles currently on the market could need human intervention at some point on their journey, which means fleet managers will still need people in their vehicles. And there are a lot of unanswered questions about the new technology that has a big impact on businesses, including questions about liability and insurance. However, there is no doubt that there could be huge benefits to moving a commercial fleet to autonomous vehicles. Instead of seeing open arms adoption of them, though, you’ll be more likely to see hesitant experimentation with them in 2018. The cost-saving potential is too tempting to resist. Fleets that focus on deliver products or people will probably dabble in the technology more heavily at first and work on getting a lot of the legal and financial kinks worked out. Once they do that, it’s likely only a matter of time before you start to see autonomous vehicles in wide-spread use throughout fleet-driven industries. What Trends Do You See Coming in 2018? Do you agree with our list? Think there are other trends you see coming to fleet management in the next year? We’d love to hear from you! Comment on this blog or connect with us on one of our social media channels and let us know what you think is coming to the industry next. If you’d like to make sure you are on top of any trends coming to fleet management, Fleet Command software can help. You’ll get the data that you need to make important decisions, cut costs, and monitor performance. Learn more about this GPS solution for small to medium-sized fleets and request a demo from our team today. You can also give us a call or contact us through our website for more information.